The Power BI product and service are improved and released at a rapid pace, and I have been conducting training and workshops since its inception. The workshop has evolved through at least three difference incarnations so far. Although I try to keep this page current, chances are that we have newer and more relevant material. This workshop can be presented to a variety of audiences and may be customized in a few different forms; for short conference sessions and all-day hands-on workshops. It can be presented in beginning to advanced sessions ranging from 1.5 to 8 hours, and customized for ages 16 to adult. Formal classroom training is also available from beginning to advanced level, and for business users and technical audiences; from one to three days in length. If you have questions, please contact me using the Contact Form. This engaging workshop will show attendees how to use Power BI Desktop or Excel BI tools to create a complete solution delivering dashboards, self-service and mobile BI. Attendees will learn to analyze information using impactful and interactive visualizations. We will create a solution using a variety of data sources that can be used on the desktop by Data Analysts, for group collaboration in the Power BI Desktop and Excel. Attendees should have a basic knowledge of database concepts and should know how to use Excel 2013 or newer. Please setup a Power BI subscription and install Power BI Desktop (free from PowerBI.com) before the session. New classroom training: one to three days – beginner to advanced, business users or technical professionals. Bring your laptop running Windows 7 or newer (4 GB of RAM is required, more is better, 64 bit OS recommended). Before the session, attendees should download and install the Power BI Desktop and create a free account at PowerBI.com (90% of the exercises can be completed in Power BI Desktop without a PowerBI.com subscription.) Note that to create a subscription you must use a work email address rather than an address from a free mail provider such as Hotmail, GMail or Yahoo!. If you have any difficulty getting signed up, follow the directions at the end of this page. 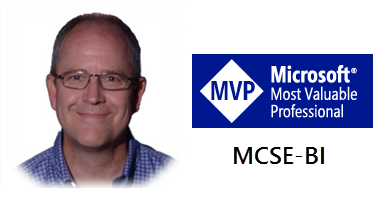 Paul Turley (Blog | LinkedIn | Twitter) is a Mentor with SolidQ and a Microsoft Data Platform MVP. He consults, writes, speaks, teaches & blogs about business intelligence and reporting solutions. He works with companies around the world to visualize and deliver critical information to make informed business decisions. Paulis a Director of the Oregon SQL PASS chapter & user group, the lead author of Professional SQL Server 2016 Reporting Services and 14 other titles from Wrox & Microsoft Press. You must use your work email address to setup a free or Pro Power BI subscription. This means that you can’t use an address from a free online web mail service like Yahoo! Mail, GMail or Hotmail. In some rare cases, your employer may already have the domain name registered with a Microsoft cloud service like Office 365 and has restricted access to other Microsoft cloud serves. If you don’t want to bother your company’s domain admin to sort this out, no worries. The easiest way to work-around this is to setup a free Office 365 subscription. That will generate a new email address for you, which you can then use to setup your new Power BI subscription. Keep in mind that this will be a temporary account unless you decide to pay when the free Office 365 trial ends in a few weeks. Go to Office365.com and choose to start a new Personal account using a Free Trial. Just fill in the form and start your account. You can use any personal email address to get the invitation mail. After you do, go to the main page and check your mail. You can get to this page later at portal.office.com. The menu launcher is in the top, left corner and looks a bit like a small waffle or phone number pad. Now, open another browser window, go to PowerBI.com and sign-up using this new email address. After completing the sign-up form, go back to your new email window and use the invitation message to get started. Now you’re all set! Nice article!!! Hey I have question about Power BI Embedded.Will it work in same way you include your charts and dashboard in Iframe or It will be separate api will be published so I can integrate each charts of dashboard/reports it individually.